What results can you expect after the operation of a trigger finger ? What complications of operative treatment can occur? If the scar after surgery painful over a long time? Is bleeding after the surgery a problem? In the vast majority of cases after surgery, the snapping, locking or clicking of the finger (thumb) is removed. The symptoms usually clear within a few weeks. Is the operation done in a longstanding case with preoperative incomplete stretching of finger middle joint, can permanently after the operation (or for a longer period) remain a reduction of stretching at the middle joint! This danger is especially true when the middle joint of the affected finger is also affected by osteoarthritis. Surgical division of the A1-pulley in a finger or in the thumb is a common and a relatively minor procedure in hand surgery. Still true: No surgery without possible complications! The illustration shows how close nerves (in the chart yellow) and the tendo sheath are located. Although rare, during surgery a nerve of a finger or thumb can lacerated. The nerve can be damaged by hook pressure or swelling or direct cut by a scalpel. 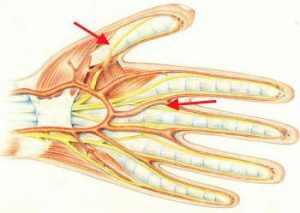 Especially during the operation of a trigger thumb is a risk, that one of the two thumb nerve may be injured. This leads not only to numbness on one half of the thumb, but often at the injury site to unpleasant „electrifying“ pain. After a few weeks a neuroma is formed! In rare cases I observe severe infections or severe movement disorders (CRPS, reflex sympathetic dystrophy). Pain after sugery is mild and most people feel after three of four days no pain. If, however, after significant improvement in days, recurrent pain is worse again, and the range of movement of the finger is reduce, so the wound should be inspected by an experienced hand surgeon. Especially when – as in the picture – the wound reddens and swells, the possibility of infection should be considered. If the suspicion is substantiated, then the wound must be opened immediately. Revision surgery in such a case should not be delayed. Even with the small scar, left by this procedure, you should remember that scars in the hand are more sensitive than in other parts of the body. Excessive (keloid) scars are very rare.